And here's my card using Hippity Hop and our Inside Pop - Fence die to create a a fence that opens up to more bunnies! And I obviously like you on FB! Omg I can't get over the fence ! I need it! What a cool new release! Very original! Love it! 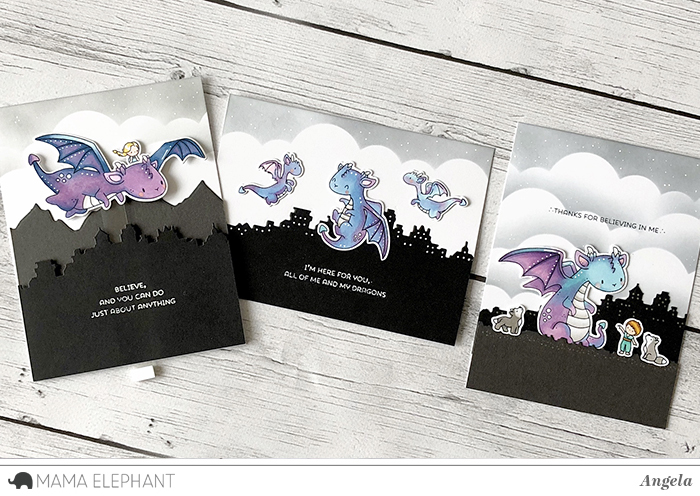 Since discovering Mama Elephant with The Dog's Woof and the joy of happy mail sent to those who share my passion of rescues, I am super excited to see the precious dragons! My grandson in Japan will love these! Amazing release....I'm sooooo in love with the dragons. What a cute idea to have an opening gate. Anything will look cute behind the fence--it adds drama to the card. Flowers? frogs? veggies? anything will be just wonderful! Love the dragons! I’m so glad to have found your site! I absolutely love this release! The dragons and bunnies are adorable! 1. I'm totally in love for your super cute release!!! These little dragons are my favourite!!! This is a great release. I really love the dragons. These are all just delightful! Awesome release! Another great release! And the samples from the designers are wonderful. Thank you for the chances to win! Hooray for release day! Such a fun dragon! I really love the dragons! Love those dragons, already ordered my set! The dragons are really cute, but the bunnies take home the prize today. LOVE them!! Everything from this release is so, so, so cute! I'm so so SO in LOVE with the dragons. They are positively adorable and I cannot wait to add them to my collection (of other dragons). I am so excited about this release! I have been a fan of all things dragon since childhood; those dragon sets are too cute! Very cute cards. The bunny card is adorable. So many cute new items and so many cute ideas! Excited to see what is new!! Oh my goodness these are so cute! I love your take on a dragon! His face is so cute! Wow, this is the first time I've seen dragon images for stamping. My husband and I both are born on the year of the dragon, so I can see myself using these stamps for cards. I especially love the Me and My Dragon. Thanks for the chance to win. This is a great release, really loving the dragons and the new circle die. I have loved seeing all the great new stamps. Great cards but I have to say the one with the bunnies and the fence has stolen my heart! you have outdone yourselves again! Another super cute release!! And one can never go wrong with dragons (especially cute dragons)! I'm off to hop. I'm obsessed with those dragons! Love the alpha set too. So much cuteness in one place! Those dragons, though, are adorable! I als like and follow Mama Elephant on Facebook! liked on FB! love this release! love the dragons, so very GOT! <3 may we all channel our inner Khalessi! Love the dragons and the bunnies.....oh heck, love them all. TOO cuuuute! Oh those bunnies! What a great release! I love those dragons!!!!! These cards are just too Adorable!! Beautiful set of dragon cards!! What a fabulous release! I love the cute bunnies and LOVE Toothless (the dragon from How to Tame Your Dragon?) so you KNOW I will be coloring him like a Night Fury. Thanks so much for so many chances to win these adorable new products! I am loving my new stamps, but this set is really cute too! Oh my goodness! Insanely cute! I totally love the fence idea! These cards are fantastic!! Love the high flying dragon over the dark mountains and skyline and that fold out fence is too, too fun! These samples are fantastic! I love the bunnys! I already like and follow mama elephant on facebook! Those tags are amazingly cute, just need a Pug one now to go with the cuteness! What a fab bunch of designs! and stamps are so cute! Awesome release! I follow on IG as anja2247. Love the card samples today. The dragon card reminds me of Tootless in How To Train Your Dragon movie even if they are not the same colors. Congratulations on a your new release. !-Maria Giselle B. Such wonderful release, love the new products and all the beautiful creation! These dragons are definitely my favorite after the yeti! Very cute new stamp sets. How do you pick just one? Thanks for the chance to win! Beautiful cards, especially the dragon ones with the fabulous Kingdom trio backgrounds! Ahhhh-mazing release! I love the dragons so much! And those bunnies are super cute! Love the frolicking bunnies and fence! I'm so excited about the dragon sets!! Everything else is amazing, too! 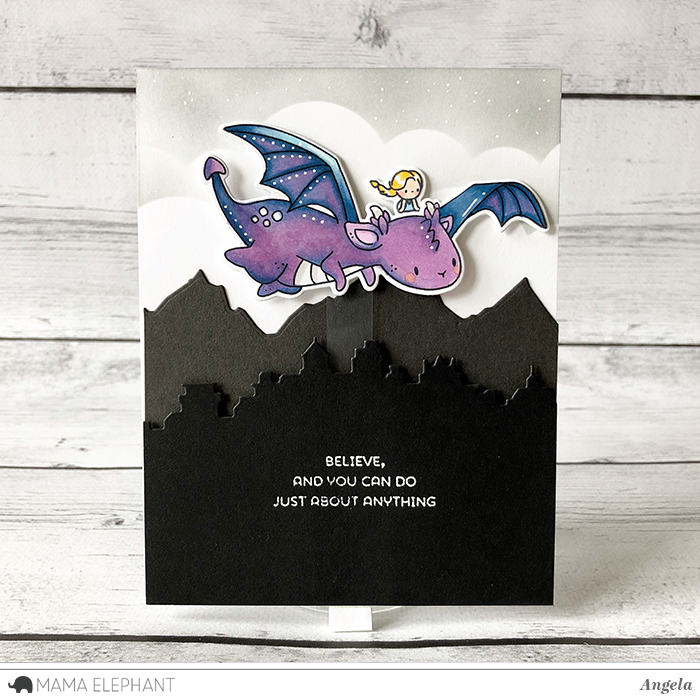 I've been eyeing these dragons on the sneak peek cards, can you say IN LOVE!!! Though I think it's all fabulous, those darn dragons have stolen my heart. It's all a wonderful release...but those dragons....<3 , <3, <3!!!! These bunnies are too cute !! Liked and shared on IG!